The Personalized Disney Princess Ultimate..
Personalized 35x60 Beach Towel - Embroidered..
Personalized Wooden Baseball Bat - Engraved..
Personalized Pewter Train Bank - Free..
Loog Guitars: Kid's Three String Acoustic..
Loog Guitars: Kid's Three String Electric..
Make Them A Shareholder - 1 Real Share Of..
Design Your Own Personalized Toddler.. Boys Personalized Sports Duffel Bag & Travel.. Girls Personalized Butterfly Purse &..
Magnaframe: Modular Magnetic Frame System -..
Across The Board: Wooden Tabletop Penny.. There's nothing more heartwarming than watching kids open their dream presents on Christmas morning. You know the children in your life best, but here are some ideas that will delight all types of kids with a range of interests. Happy giving! Would she like a custom stuffed animal of herself or a family pet? Would he laugh out loud for a Selfies photo album specifically for pics of "Me, Myself and I"? Silly gifts are always a treat for kids! Think about their current fascinations and choose a gift with those subjects in mind. A Darth Vader alarm clock gets a Star Wars-obsessed sleepyhead out of bed in a flash, while the Zoomer Dino - an interactive dinosaur toy - delights T-Rex afficionados. A fitness-tracking wristband is a great Christmas gift for kids that helps them make healthy choices in a fun way, while a balance ball can serve as a desk seat or a plaything for the whole family to enjoy in the outside! Noise-canceling headphones let kids escape into their own worlds, and a USB turntable merges music forms past and present for a full family audio experience. It's easy to take hundreds of photos today, but a Polaroid Digital Instant Print camera is both old- and new-school, with tangible pics to save and display in real life! Or get them a selfie remote to elevate their photo-taking game big time. Whether you choose the Sphero app-controlled robotic ball to enhance game time with virtual reality features or spring for a home arcade table, any kid who loves to play will be thrilled. A universal charging station and accessories will get major use from kids, as will a personalized laundry bag, fingerless texting gloves or a monthly sock subscription! Christmas tunes have been playing inside every store for weeks now, and you’re still feeling clueless as to what gifts to give those kiddos. It’s clear Jingle Bell Rock will not inspire the right Christmas gifts for your little rascals. So it’s time to get down to business and choose some special surprises to put under the tree. 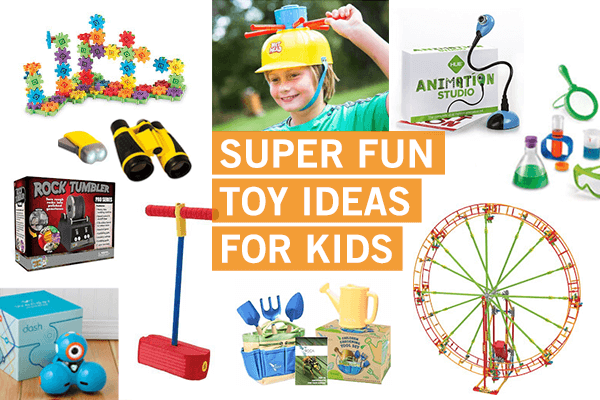 Look no further than this supersized list of Christmas gifts for kids.